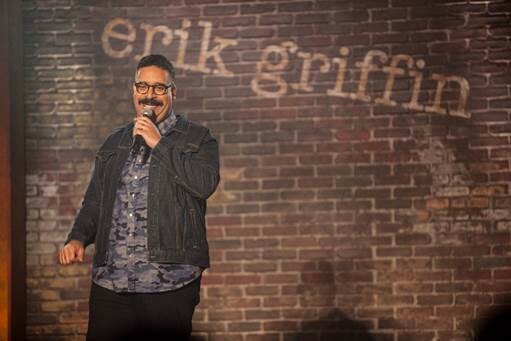 Comedian and I’M DYING UP HERE star Erik Griffin returns for his second SHOWTIME comedy special ERIK GRIFFIN: AMERIKAN WARRIOR, premiering Friday, June 8 at 10 p.m. ET/PT. Filmed at the Star Theater in Portland, Oregon, the new hour-long special flips convention on its ear with Griffin deconstructing everything from social norms, personal responsibility and lazy protesting to the righteously religious and the female renaissance, all while skewering his own sense of male entitlement. To watch and share the teaser for ERIK GRIFFIN: AMERIKAN WARRIOR, go to: https://youtu.be/cWHzMm2_qTQ. A towering force of comedy, Griffin is most recognizable as the mustachioed Montez Walker on seven seasons of the hit series Workaholics. Griffin is part of a large ensemble cast in the SHOWTIME drama series I’M DYING UP HERE, currently airing its second season Sundays at 10 p.m. ET/PT and exploring L.A.’s famed ’70s stand-up comedy scene, where the careers of legends such as David Letterman, Jay Leno and Richard Pryor were launched. The series stars Academy Award® winner Melissa Leo, Ari Graynor, Michael Angarano, Clark Duke, Griffin, RJ Cyler, Andrew Santino, Al Madrigal and Jake Lacy. Produced by SHOWTIME, the series is created and executive produced by Dave Flebotte, and executive produced by Golden Globe® winner Jim Carrey, Michael Aguilar, Christina Wayne (Assembly Entertainment), Cindy Chupack, Adam Davidson and Endemol Shine Studios and based on the non-fiction book of the same name by William Knoedelseder. Griffin’s first hour-long comedy special, THE UGLY TRUTH, premiered on SHOWTIME in July of last year, and was one of the network’s top-rated stand-up specials of 2017 with over one million viewers across platforms. His previous television credits include Blunt Talk, One Day at a Time, You’re The Worst, Bob’s Burgers, Arrested Development, Harvey Breaks as well as his Comedy Central Presents Half-Hour Stand-Up Special and his debut comedy album, Technical Foul: Volume One. On the big screen, Griffin was previously seen in Mike & Dave Need Wedding Dates and First Girl I Loved. ERIK GRIFFIN: AMERIKAN WARRIOR is directed by Aristotle Athiras and executive produced by Brian Volk-Weiss, Cisco Henson, Itay Reiss, Matt Blake and Andy Farag for Comedy Dynamics.